Download the VAICOM PRO User Manual (PDF) here. 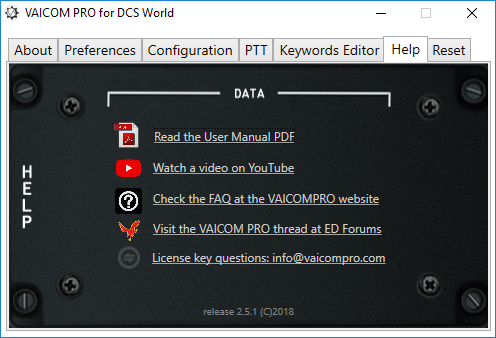 ​​This document contains all the detailed information on VAICOM PRO installation and use. Read it carefully to get the most out of your setup. Just need a quick introduction? ​Check out below the 15 min. overview video on YouTube covering VAICOM PRO basic setup and usage. For all the detais read the User Manual PDF, download link above. Check the VAICOM PRO thread on ED forums. ​Lots of knowledgeable users out there to whom you can ask your questions. Is there a problem with activation for your license key? ​Get in touch with info@vaicompro.com and it will be looked into asap. There are some reports of users with the Elite Dangerous plugin EDDI having issues with keywords training mode. Disabling EDDI solves this. When applying the FINISH steps to update the database, the 'when I say' field can appear blank. This is a known graphics bug in VA and can be ignored: the content is actually there. The Instant Select feature does not work for the F-5E Tiger II. This is because of the specific way the radio was modelled in this module. The Select command must be used to switch recipient in a category. "Great software. Worth every penny." This software product is provided as-is. References to VoiceAttack.com or Eagle Dynamics brands does not imply these companies involvement or endorsement. ​(c) 2017- 2018 All Right Reserved.